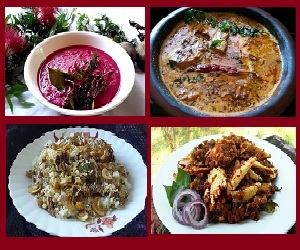 Upma is a common South Indian breakfast. Though traditionally it is made of rava, here is the simple recipe of a different type of upma using Broken Wheat as the main ingredient. Wash and soak the broken wheat in enough water for about 10 minutes. Then drain it using a strainer and aside for 5 more minutes. Heat oil in a pan and crackle mustard seeds. Add urad dal, dry red chilly, curry leaves and sauté well for few seconds. Add onion, little salt, green chilly, ginger and sauté well until the onion turns to light golden color. Add in salt and water. Cover the pan and allow the water to boil. When the water starts boiling, add the soaked broken wheat, mix well, cover the pan and cook for 8 to 10 minutes on low heat. Stir in between twice or thrice, add grated coconut and mix well. 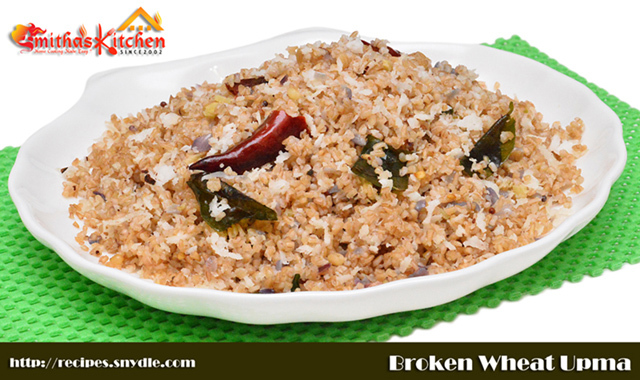 Broken Wheat Upma is ready and serve hot.